If you've ever wanted to print monthly calendars from your Access databases, then this seminar is perfect for you. Versions: I will use Access 2007, however the lessons are valid for all versions of Access back to AC2000. I will show any differences between 2007 and 2003. The seminar works fine with Access 2010 and 2013, however the Calendar Control object was removed from this version by Microsoft. This is not a problem, since there is now a built-in Date Picker. See notes in the comments section below. You will begin by creating a basic table to store our appointment data. We'll also make a simple form to edit and add new records. Next we'll build an appointment list form, where we can see all of our appointments. Double-click on an appointment to open and edit it. We'll also make a checkbox to allow us to see open vs. closed appointments (close it when you're done with it). You'll also learn about triple-state checkboxes where you can see open, closed, and ALL records. In the next lessons we'll build a form to pick a date using a built-in Microsoft Access ActiveX Calendar control. Using this date, we'll generate our own form that looks like a full-sized monthly calendar, complete with all of our appointments on it. One of the things we're going to learn how to do is make the first day on our calendar form figure out what the first Sunday on or before the start of the month is, then build the rest of the calendar accordingly, greying out any days that are before or after the selected month. We'll tackle that with a little bit of VBA programming. Of course, you'll be able to double-click on any appointment on the calendar to open up a popup form to edit that appointment. Then, once the form is completed, we'll create the printable monthly calendar report. We'll actually make two versions - I'll show you how to lay it out portrait and landscape. This seminar is perfect for anyone who wants to do any kind of scheduling in Microsoft Access. You can store your appointments, edit them easily, and print out professional-looking monthly calendar reports - all from within Access. This seminar is long (almost two hours) but it's broken up into easily managed lessons of about 10 minutes each. You can sit down, watch a lesson, review the material, test the code out yourself, and experiment. Do a little bit each day. It's long, but it's comprehensive - you won't miss a single step as I've recorded everything from start to finish. All of the sample database files are available on my Web site (instructions on where to download them are in the course videos). They are available in Access 2007 and 2000 formats. This seminar is available to view online in the Amicron Theater. You can click here to watch the first two lessons absolutely free. The sample databases are only available for Access 2007 and 2010/13, however we do cover Access 2000 and 2003 in the class. Richard on 1/1/2009: Manage your appointments, and create printable monthly reports from your Access databases. If you're using Access 2010 you will NOT have the Calendar Control object. That's OK. There is an addendum video in the TIPS section that will show you how to use a simple text box and the Date Picker to get around this. There is also a SECOND ADDENDUM video and database file available to teach you how to add more control buttons and the name of the month to the top of the calendar form. Don't miss this one! There is also now a THIRD ADDENDUM to show you how to create events that span multiple days. Watch this one after you've finished the whole seminar. I've also put together a separate ACCESS CALENDAR TEMPLATE database that you can purchase separately that mimics the old Access Calendar Control. the error occurs whenever the +1 is in my sql line, in both Access 2007 & Access 2003, havnt tried this on Access 2000yet. what am i doing wrong ? i don't know why i can't just +1 to a date. but this was on two different computers, two different versions of access. Richard Rost on 9/18/2009: That's very strange. I also used two computers as well, and two different versions of Access (2007 and 2003). I had no problems with this at all. If anyone else has the same issue, please let me know. Earlier it looked like you just didn't type in the full SQL statement. First of all excelent tutorial, really easy to understand and fun to watch. With regard to changing the caption of the form (about 7.20), I was wondering how one might change a larger heading in the form of a label. I ask because I know alot of users dont particularly notice the captions. I usually like to put a good sized heading on all forms just so its easy to see what they're all about. Just curious. once again I must compliment you on your videos theyre the best i've come across. very good work. Look forward to more Thanks. MyLabel.caption = "HEY! CHECK THIS OUT!" Now sit back and watch your label start flashing. I love this trick. David Leech on 9/19/2009: Thanks for the quick reply in regard to changing labels on the triple click checkbox. ApptListBox.RowSource = "SELECT CalendarID, DateTime, Description FROM CalendarT WHERE Closed=True ORDER BY DateTime;"
ApptListBox.RowSource = "SELECT CalendarID, DateTime, Description FROM CalendarT WHERE Closed=False ORDER BY DateTime;"
ApptListBox.RowSource = "SELECT CalendarID, DateTime, Description FROM CalendarT ORDER BY DateTime;"
I think its a little easier for users to see whats going on. I dont know if anyone else might find that helpful. I've completed all of the forms etc both in a blank database aswell as integrated in a project i'm working on. As I understand it, the canceled appointments remain in the calendar. How would one go about making the text for these apointments red (therefore showing that the appointment is a canceled one). Also within an application I am building there are two appointment types (maintenance and open house) how would I go about making text either say green or blue to show the two different types of appointment. If any of these things are covered in other videos of yours let me know. Richard Rost on 9/20/2009: David, excellent code. Put this right before or after the other IF/THEN clause that colorizes the days from other months. Richard Rost on 9/21/2009: David, you cannot change the text of a single record in a LIST BOX the whole box has to be the same color. The only way to do this would be with using a SUBREPORT instead of a list box. It requires a lot more work, but it can be done. When I get some time, I'll try to add this as another lesson to the seminar. Is anyone else interested in seeing this? Richard Rost on 9/23/2009: Thanks, David. There are third-party listbox controls you can purchase that DO offer that functionality, but I try to stay away from those in my classes. Like I said, you COULD get colors with a subreport, it would just involve a lot more work. Cathy on 10/21/2009: The date picker doesn't seem to be commuticating with the active x calendar on the DatePickerF form. The 'set first day of month did not show 10/1/2009 in datepicker and cannot find the 1st sunday. What am I doing wrong? This is the 3rd Calendar database that I have started from scratch. Richard Rost on 10/21/2009: Cathy, what version of Access are you using? Cathy on 10/21/2009: Access 2007. I continued with some more of the vba code and I got DatePicker to find the 1st Sunday before 10/1 - but if I exit out of MonthlyCalendarF and DatePicker, select DatePicker again and enter 8/30/2009 MonthlyCalendarF stays the same with 9/27/2009. Kim Boren on 10/22/2009: Your mention of making us pay our dues is so true. I messed up doing the rowsource code. I had to go back through the whole calendar to verify that I had done the rest of it correct. I did learn more than if I had copied it from your website. Richard Rost on 10/22/2009: RE: Paying Your Dues... it's so true. When I was first learning how to program in C (a long, long time ago) I used to just copy and paste source code from the sample CDs they include with books. Didn't learn a thing. Then, I started typing in the code from the book itself... that extra little step is so crucial. Don't JUST copy the code though, EXAMINE it as you're typing it. Try to figure out WHAT is going on, and WHY. Alan Hill on 10/28/2009: I have just got back from a three weeks holiday in Thailand. I needed to unwind a bit so I have just run through your Calendar Seminar. I loved it. The use of Excel to generate code was fantastic. Lots of tricks and tips and really helpful code snippits. You really know your stuff. Thankyou. Great seminar! I am trying to build a vacation calander to manage employee vacations. How do you incorporate an enddate on the input form where the calander will look different for a range of dates where there are vacations? For example, if an employee is on vacation for a week, I want to put in the start date and end date so that I see the same employee on the calander for the five days and those days are red or whatever. Can you help me with that or tell me if that is covered in any of your training? Richard Rost on 1/16/2010: Rae, I'm not sure I understand your question. Could you give me some more details, please? rae davis-craig on 1/16/2010: Thanks Richard for attempting to help me with this. I am trying to builed a calander for managers to manage employee vacation time. So instead of using DateTime category, I would like to use StartDate and EndDate so that the manager can use the CalendarF form to input the StartDate and EndDate for each employee's planned vacation. After doing so I would like the calendar to use the start date and end date information and put the employee's name in for those dates on the calendar. For example if employee X has vacation from 1/18/10 through 1/22/10, I want the calendar to display the employee's name on the calendar on 1/18, 1/19, 1/20, 1/21, & 1/22. In addition, I want to make it look different than any other dates, so that when the calendar is printed the mangager can quickly see the weeks employees are on vacation versus weeks when there are no vacations. I hope you can help me with this. To sum it up I need to know how to incorporate an end date into what you have taught us, how to make the calendar represent a range of dates (example from x to x) and how to make those dates appear different from dates where there are no vacations. If you want it to show the current date when you first open the form, put that code in the FORM_LOAD event. It will NOT work in the FORM_OPEN event. Dana on 5/21/2010: 1) Have I missed something - No matter what date I click on the calendar control it opens to the same place in the month. 2) because dblclick event on the list box only opens existing data, I have used the date text box double click event to open the CalendarF to add mode. I have set the CalendarF to requery on close, but I have to close the MonthlyCalendarF to have the new data show up. Can I requery the MonthlyCalendarF from the CalendarF? Also I used a macro to open the form and I am concerned that creating 42 macros in the Date Text Boxes will make my database sluggish. Dana, (1) if you open the calendar control and its based on a date that has no value, it will always appear to open to the same date. To change that, assign it a date value. I believe I covered this in one of the lessons. (3) I wouldn't worry about 42 macros making your database sluggish. That shouldn't be a problem, but you might want to ask yourself WHY you need 42 macros? Can you make one bit of VBA code and just send it the control name? When in doubt, VBA is always better than a macro, IMHO. 2) The next project was to colour each listbox according to criteria - Important.Red/1, School Holidays.Yellow/2 PublicHolidays.Green/3 ect. I added a column [Holiday] to the table CalendarT and added a combobox to the form. Then added the column to the Listboxes rowsource. But I need to click the box to get the value. So that's no good. 4) I added a ShortDate to the CalendarT table then I tried DLookup with the StartDate+x but I have not got the DLookup Where clause right. At the moment I am thinking of using a recordset so I can get more control and set the background colour accordingly. Sometimes after a break a simple solution comes to mind but It has not happened yet. If you can think of an easier way I would love to know. But a simple solution eludes me. Am I making a mountain out of a molehill? Alan Hill on 5/31/2010: Hi Richard Hope you can point me in the right direction please. This is where I am at. Ugene on 6/8/2010: Is there any way to set the Calendar to start on Monday and end on Sun.? I tried different combitions with the DatePickerF button, but didn't come up with a solution. Thanks for the help. I have done exactly as you are saying and quadruple checked it to make sure I didn't screw something up. At around 9:30 in this video you put in an sql statement that I put into my 2003 database and everytime I add it all the data on my appt list box disappears when I go back to form veiw. Any ideas how to fix this? Selby Halfpenny on 7/8/2010: Richard - When I type code in the Visual Basic Editor, the cursor will not move forward and jumps back to the last word typed. Those letters typed turn red - intellisense does not work properly. Do I have reference problems Richard. Many thanks in Advance for your help. Selby, I've never heard of this problem before. It sounds like an issue on your computer. I would try (a) rebooting, (b) reinstalling Office, (c) looking for other programs that might be conflicting with Access... in that order. If it's still happening, let me know and maybe we can figure it out. I'm using Access 2010 for my calendar, and as you are probably aware,Calendar Control is not included in Access 2010. I have managed to get around that by manipulating the StartDate to bring up the Calendar form for the correct month and starting date. But I cannot get the DatePickerF StartDate to show the pop up calendar which emulates the Calendar Control. Probably because it is just a text box and not bound to anything. Do you have any suggestions on what I can do? Thanks a lot! I got your calendar program working OK, but that was my starting point. I decided to use VB and sql 's to populate the listboxes. Easy,done it heap of times, but I keep getting odd results. It appears I have to convert dates to US dates to use in SQL's. What a pain. So I converted StartDate to mmm ddd yyyy which is a USDate Format. Ran my loop 1 to 42 but I am getting a mismatch error trying to add 1 to StartDate. As you have international customers, can you please look at SQL's and Dates on non US systems. Alan, the date format shouldn't matter, as long as you're storing the value internally in a date/time field. The regional settings are something that you set in your Windows Control Panel. All of the calculations should still work OK. I finally cracked it. Anyone who does not live in the US needs to know this. Assigning a .rowsource to a listbox will NOT work properly if you are using dates as criteria with a SQL. The first part of your expression is fine but after the "SELECT * FROM CalenderT WHERE " & "CDate=" - the next part has to be USDate format. USDate = "#" & Month(TD) & "/" & Day(TD) & "/" & Year(TD) & "#"
Some of the listboxes were OK some were not. I had to requery each listbox or click the refresh all to see the results. Once I used the USDate format all my problems were fixed. As you live in the US. I think it would be difficult for you to view my problem. Access is not entirely International we have to find ways to fix what the Access Team have missed. They do know about it. Pity they have not fixed it. But I am very happy my calender now works as well as yours. Thanks for posting that, Alan. Kenneth Lange on 10/31/2010: The Seminar video for access Calendar Video 5 (Lesson 5) Plays showing only the beginning video image in amicron video player. It seems to work for me when viewing the seminar thru IE. Kenneth, it sounds like that particular video might not have downloaded completely. Try downloading the course again. Several hundred people have purchased this seminar, and so far yours is the only complaint in over a year, so it's probably on your end. Kenneth Lange on 10/31/2010: Using Access 2010, I do not have the ActiveX Data Picker tool you refer to in Access Calendar Seminar, 6. Monthly View Form 3 Seminar near time stamp 4:48. Kenneth Lange on 11/2/2010: Hello Richard, I am using Access 2010, but it does not use the Active-X Calendar Control. Is there a way to Make the Access Calendar work without the Active-X Calendar Control, or is there a third-party control that you reccommmend for Access 2010? Apparently, Microsoft isn't shipping the good old Calendar Control with Access 2010. That control has been around since Access 2.0, and I'm sad to see it go. However, there are several different things you can do in Access 2010 to show a calendar. Here is a link to MSDN that discusses some alternatives for the calendar control. I plan on addressing this in more detail in a forthcoming lesson that I will add on to the Calendar Seminar. Paul Civitarese on 11/14/2010: On lesson 4 At the end it skips the last short cut button out.The Button Is Open Calendar. Can anyone help me? Paul, at what time index in the video are you seeing a skip? Richard on 11/18/2010: Microsoft listed the Calendar OCX Control as one of the things that were removed from Access 2010. So if you're using 2010, you'll get an error message when you first open the sample class database. The GOOD news, however, is that YOU DON'T NEED IT. 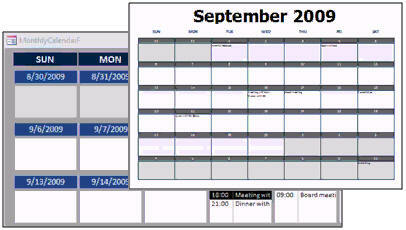 The only reason I used the OCX control in class was to give Access 2003 (and earlier) users a form to pick a date with. 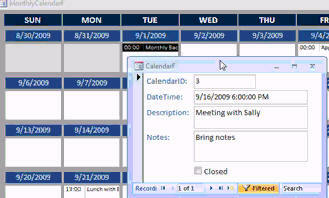 Now, Access 2007 and 2010 come with a Date Picker automatically built in. Just click on ANY date field, and you can pick a date. So, Access 2010 users, just ignore the lesson where I build the Date Picker form. As the ActiveX Calendar Control isn't available in Access 2010 I was just using the StartDate textbox to get the date value a user had entered to produce the Monthly Calendar but as the CalculateStartDate function can change this date to show the first Sunday (which can lead to the month changing) this caused a problem when colouring the none months differently. To get past this I placed an invisible textbox on the DatePickerF which got the month from the initial date, stored it in a variable and then ran the CalculateStartDate, Now i can loop through and colour using the correct month. Very elegant solution. Thanks for sharing. Honestly, I haven't run completely through this seminar using Access 2010 yet - as I recorded it before 2010 was available. I appreciate you noting any other problems you might find. on 12/30/2010: Hi - will this work with a multi-table format? for example listing each meeting participant from a "Customers" table? I'm not sure I understand the question. Could you clarify, please? Brent Rinehart on 1/2/2011: Great tutorial I would like to know if you can steer me in the right direction I am wanting to convert this calendar database to a calendar where there would be a form to generate employee shifts and would display person1 9-5p, person2 11a-6p, etc. in the form there would be a dropdown box with the employees and the different shifts they could possiably work. you would select the day, person, and shift and all that would display in the calendar to be handed out to the employee's, would this siminar be hard to change to accomidate this? If you know that you have distinct shifts, then you could construct a form to just select people for those shifts, sure. Let's say you have three shifts (1st, 2nd, 3rd) and you want to set it up for the week (7 days). Just make a total of 21 unbound combo boxes on a form. Select an employee for each shift, then make a command button insert all of those people into your schedule table using a recordset. If you want to be able to have multiple people for each shift, then make multiple combo boxes for each shift. Sure. Anything can work. I'll add this to my TODO list for the Attendance Seminar. haroon sattar on 1/25/2011: hi richard. i am using a database for clinical application. would this seminar help me with creating caleder in access for making clinic and investigation appointments and update this to my patient data. Yep. That's what this seminar is all about... creating a scheduling database and then creating on-screen and printable forms that look like calendars. Watch the intro video on the calendar seminar page. It will tell you everything that it covers. hector chapa on 1/30/2011: hey richard rost could you do a webinar were you could send messages thru access but not using outlook and forms like to do list to co-workers if you can do it i am totally buying it. I've added a seminar called Sending Email with Access WITHOUT Using Outlook to the Waiting List. Make sure you vote for it. So check and make sure that you have Date1, Date2, Date3, etc. instead of DayLabel1, DayLabel2, etc. as your code indicates. I am wonder what is not right here? Hope you could give me some advise. Thank you. Sorry, to ask you the same question for two times. I did try the code you advised, I still can't get my Dbl click function work. I try to change "[Clock ID]=" & Day3 to "[T.Employee List]. [Clock ID]=" & Day3 , it is still not working. I am wondering whether the Raw Source SQL make my Dbl click function fail. Now I only have Scott show in 1/3/11 MonthlyCalendarF listbox. How could I make Scott to show in 2/3/11 and 3/3/11 of the MonthlyCalendarF too? Another question, I am setting a staff holidays MonthlyCalendar to view who is on Holiday each day. Each day I would like to allow only 6 staff on Holiday, how could I put a Count Fuction in my listbox? If there is more than 6 staff put holiday on the same day, a PopUp msgBox appear "No Space Available." Hope you guide me the right direction to get the issue solve. Thank you. stLinkCriteria = "[T_Employee List]. [Clock ID]=" & "'" & [Day3] & "'"
ellesha on 3/9/2011: If I have an Event"A" happen Date from 1/3/2011 till 3/3/2011. How to make Event"A" to show in our calendarF 3times on 1/3, 2/3 and 3/3? It's been a while since I recorded that seminar, but I don't believe I covered creating RECURRING appointments. I did cover that in the PAYABLES seminar, however... how to make recurring bills that come back month after month (or any set time period). The calendar seminar was more focused on the DESIGN of the calendar - not the actual scheduling. Should I perhaps make this an add-on? ellesha on 3/10/2011: Of cos it will be very helpful that you could create an add-on tutorial covering RECURRING appointments. "The Microsoft Calendar control (mscal.ocx) is not available in Access 2010. An alternative is to use the date picker control in Access 2010. Opening an application from an earlier version of Access where the control was used will generate an error message in Access 2010 and the control will not appear." angela on 3/21/2011: it looks like chapter 5 you can hear it, but you can not see the tutorial please advise. Try reloading it (refresh the page in your browser) or if you're watching it offline, download the course again. There's nothing wrong with the video, but if for some reason it didn't download 100% completely to your system, that could happen. David on 5/8/2011: Alex Hedley, on 27th November 2010, gave what Richard described as a very elegant solution to get past the fact that Access 2010 no longer has the Calendar Active X Control. Try as I might I cannot work out the code to get the date into a variable. I have put a text box on the DatePickerF form called "CalendarDate" which I have set to =StartDate, but I cannot get it to update when I change the date picker's date but not to update when I run the CalculateStartDate Sub routine. Not that I'm aware of. As long as they both have unique names, you should be OK.
David on 5/10/2011: Further to my earlier post, I have solved my problem. I put a text box called, in my case 'startday', (any name will do, but I did not use 'calendar' in case it is a reserved word) which has the Access calendar as an entry, and set 'startdate' to equal it with a me.requerry to make sure it does equal it before I use the routine to calculate the first Sunday. It works. Basically you name a textbox on the form [DateMonth], make it invisible, then in code you assign the [DateMonth] the same value as the [StartDate] (DateMonth = StartDate)and now you can perform the calculations needed to colour the [CalendarF]. Let me know if it makes sense and hopefully you get it working. Thanks ever so much. I had, in fact done something similar, but I make the visible text box 'startmonth' and 'startdate' invisible and equal to it. That way I do not have to reset it to nothing if using the datepickerF again, it gets reset by access' own date picker! I do however ex abundante cautela add a me.requerry. Again many thanks for your full and very helpful answer. Alex Hedley on 7/7/2011: Dawn which version of Access are you using? There has been some problems with the new version as the calendar control has changed. Another thing to check is the spelling. usually pops up when it can't find the field because it is either not there or spelt incorrectly. Is the textbox on the form named StartDate? Dana on 7/10/2011: I have added two subforms to my form "CalendarF" one of the fields list the "Type" of course public or group. Both of these subforms are formed from linked data in separate Databases and list the participants attending these courses. I placed the "group" subform 'GroupQF' on top of the 'PublicRegF". 'GroupQF'visible is set to no. I have been trying to show the form only when public appears in the Type field. nothing happens. Can you help? I had a quick go recreating your problem with a few other controls instead, (just used two buttons) and it seems that when the control is made visible it's order isn't kept so even though the hidden button is above the other button even when it is made visible it doesn't appear over the top. You try either try offsetting it and seeing if it appears or only have one subform on to test whether it appears or not, then try adding the other one. I have placed one form on top of the other so that when the [type] is Group only the group form will show - when the type is public only the public form will show. I have yet to have any issues with regard to what order the forms where placed on top. My next goal (isn't there always something more!) I would like to have the [courses] text to change colour in the onscreen calendar to show [type] group show in vbblue. I read that the list box must all be the same text - can the change of colour be applied on the calendar form? Glad you got it working :). If you didn't want something as major you could add a label that changes its text and colour and use it as title. Dana Michaels on 7/26/2011: thank you for your reply - but I think you misunderstood my next goal. I don't want to make the detail section of the Calendar Form change color on selection of Type "Group" or "Public". I would like to know if there is a way when I open the Calendar that all group course numbers will be vbblue the course number is coming from the ApptListBox and is the equivalent of your original description ie: text. I want to be able to quickly see which are group course or which are public without double clicking to open the CalendarF form. As you have stated the list box can't be altered to have differing colours. Dana Michaels on 7/29/2011: If the data is drawn from the apptlistbox ([Type] is in that list row could you code the Calendar form itself (not CalendarF) to change on Load event to change the colouring? Alex Hedley on 7/29/2011: I'm not sure what you mean. Are you wanting the days colour to change on the MonthlyCalendarF? Dana Michaels on 8/2/2011: yes, the MonthlyCalendarF is has two columns 1 showing the DATETIME and the other showing the course#. The source data includes (but doesn't show) the [Type] of course "Group" or "Public" I would like to change the course# from auto black to vbGreen when the course is Group. Lindray on 8/8/2011: I am making a calendar in access (2010) using as reference the tutorial, but when I set the day of the month with a week I can not, access 2010 does not have the calendar control to display and Access 2007. another code which I can use to perform the same function. There is a wealth of comments below discussing how to address the problem that has arisen since Access has removed the Calendar Control from it's new release. Robert Fleming on 8/14/2011: In the DatePickerF if you select April 1st 2011 Why, in the MonthlyCalendarF, is April 28th,29th and 30th greyed out. Is this in your version or Rich's. Is it just that month that isn't working? Just that month in that year? John Brodie on 9/3/2011: Hi Richard: Is it proper to say at 3:17? The triple state check box on the unbound form named ApptListF is controlling the row source property of the list box object named ApptListBox? William Ryan on 9/6/2011: I am about halfway through the course, which seems to be very well written and "almost" what I'm looking to do. My problem is that my database is a for a small service call center. I have three related tables, CustomerInfo, ProductInfo and ServiceInfo. I'd want the appointment calendar to list information from all three of these tables. At present I have a query that summarizes this, but I'd like to be able to double click the calendar event and open the ServiceInfo form. I've tried to create the form based on the list box from the first 3 lessons, but I haven't been able to make it work. Instead of populating the list box with items from the tables or query, I get #Name? errors. Aphillips on 9/23/2011: Is there a way you send the appointments made in access to Outlook? Yes, it's possible, but it requires some VBA programming. I'll try to cover this in a future lesson. APhillips on 9/24/2011: Thank you. I look forward to the vb class. I have taken the first four of your vb classes the past couple of weeks and plan to use it to enhance my access database I created for work. We are required to put all of our appointments in an outlook calendar. It would save a considerable amount of time to be able to automatically transfer the appointments to outlook. A one-time transfer TO Outlook, or even a one-time transfer FROM Outlook is no big deal. That's maybe a dozen lines of code. The problem is keeping them synchronized and being able to go back and forth. That creates some issues. Mike on 9/27/2011: Has anyone successfully published this calendar to the web as part of an Access Services application? I ask as Access Services limits most automation to macros and I am wondering if this calendar will work. I have Access 2010 and as you've pointed out, the ActiveX Calendar has been removed in 2010; how do I get a calendar on the nominated form? I'm using Access 2010 and ccannot get the Triple State check box to work. I have followed your instruction and when I try to select the check box nothing happens. Can you advise? I've just tried Rich's copy in Access2010 and it isn't working but I deleted the original checkbox, created a new one and named it ShowClosedItems and it works. Did you create the whole database from scratch or are you using the sample one? Rich the original checkbox looks "old" as if it was created in a much early edition. Thanks for the heads-up. I think it was created in Access 2003 and up-converted. Yes - I have created the dbase from scratch and followed Chris' example very carefully but it still does not work. I'll have to re-check everything from scratch as I'm pretty new at this Access thing! Alex Hedley on 10/19/2011: Deon one suggestion is to add some message boxes after each case saying different things and then see if they fire to check you have the checkbox name correct in the code. If they work then it might be your SQL string. Check for spaces after Order By etc. Try printing the SQL to see if that is correct. Most of the time it is a silly spelling mistake or something trivial. Vera Schafer on 10/21/2011: If I try to open the MonthlyCalendar2R from Sample Database on Access 2010, I get a error: Forms!DatePickerF!StartDate and Access doesn't allow me to close it. I have to restart Windows. I know it is because I forgot to open the Form, but is there a way to avoid having to restart Windows? Am I missing something? You shouldn't have to restart Windows. That indicates to me there is a deeper problem with your machine. Access shouldn't take your whole system down like that... even if your form has a problem. Vera Schafer on 10/22/2011: I'm trying to build my dbase from scratch with Access 2010. Everything works fine until I reach instruction on Lesson 4 @ 11:00 on your video and I get an error. Your previous response was that I should remember dates need to be enclosed in # signs. Even though the video doesn't show it did, I tried with and without # and still it doesn't work. Any hints? mike baxley on 10/30/2011: Does anyone know how to expand the alz video player to full screen? After working the calendar build several times as a learning tool due to the fact that I am self-taught. The light bulb came on that the closed events were showing up in my MonthlyCalendarF form. This should not be and is not acceptable since if the appointment was canceled it should be no longer showing in that fancy calendar. OutLook removes it, so why not my calendar? When you build your first list box (I use the query builder, safer with inch long nails) make sure to drag down the “Closed” field and in its criteria set it to “FALSE”. Add a link to the ApptListF to see your canceled/closed Items. Now if we could just do recurring appointments like Outlook (Hint Hint Rich) we would all be as happy as bugs in a rug. Would blame it on a blond moment but it's all gray at my age, not that I am ancient now! sean leach on 1/2/2012: i also had the same problem, i can only see the beginning image, of the calendar with monthly calendar form, part 2 thought the video. i could hear everything, but not see anything. i will try to redownload. sean on 1/2/2012: i tried to redownload the file, still did not work. i when i deleted the folder (prior to redownload) i noticed was in windows media format, so i was able to watch it zune player. if you have any problems with vid, thats what i rec. I use your calendar form in an Access 2003 database and I have changed it a bit. I wanted the plus and minus buttons on the calendar form, as you have shown in the second calendar addendum video. But ... It does not work properly. On 30 January 2012, I clicked the button one month ahead and jumped to date .... March 1, 2012. February has only 28 days and this year is a leap year, so this month has 29 days. Some months have 30 days and the rest of the month have 31 days. There are also problems when you click on the button -1 month if you are 30 or March 31. Do you have a nice solution to this problem? Harold Patton on 2/22/2012: I can not get the report to show the grayed-out days. I'm using Access 2010 and noticed there are some changes. I selected the "MS MonthView Control 6.0 (SP4)". Is there anything else I need to modify and/or change for Access 2010? Otherwise I'll keep looking for an error I may have made. MySQL = "SELECT ... WHERE DateTime >= #" & DateField & "#"
Scott Adkins on 4/1/2012: Richard, I too cannot get this Lesson to play in the downloaded format. All the other lessons seem to work. I have removed and re-installed twice with no help. Allamaar on 4/21/2012: I'm using Access 2010 and thank you to Comment from Alex Hedley @ 11/27/2010. it was necessary to add the invisible text box. Jillette on 4/24/2012: I have downloaded the sample database;but, similar to Vera Shafer (21/10/2011)cannot open the MonthlyCalendarF. I receive a request for a parameter value - Forms!DatePickerF!StartDate. If I type in a date I receive the message - This expression is typed incorrectly, or it is too complex to be evaluated. For example, a numeric expression may contain too many complicated elements. Try simplifying the expression by assigning parts of the expression to variables. I have checked all the code with the online seminars (which rarely mention my version of Access) and handbook and watched the addendums (Ihave Access 2010)is this a problem with 2010? Please help as its driving me mad!!! Jillette on 4/26/2012: Just an update on my previous post. I can now open the monthlyCalendarF, but have lost the month and year at the top!! If I put into the MonthName TextBox's Control source =Format([Forms]![DatePickerF]! [Calendar],"mmmm yyyy") i get a message box asking for the parameter value of datepickerstart time (same as before)!!! it freezes my computer (perfectly working)and i have to close access down and restart. Please can anyone explain and help me with this. thank you. I see you have Access 2010 and watched the addendums. Have you removed the reference to the incompatible calendar control? Alex Hedley on 5/1/2012: Was it 'OpenMonthlyCalendarB' that you didn't understand - I'd put the names of the controls on the picture to show what they were called so you knew their names for the code in VBA. Did you know there was an updated on version of the Calendar for 2010. The video tells you which address to go to - try downloading the new version and see if that works. How do you want the weekly one to work? You could take the principles from the seminar and scale it down to just 7 days instead of 42. Steve on 7/18/2012: This is great for single day entries. It would be great to have one that you can have a start date and end date and the calendar would show the entry on each day between start and end dates. Yes, that would be a great addition. Perhaps in a followup class when I get some extra time. Dana on 9/1/2012: I need to know how to bring an appointment (course)across the week - it was mentioned before in 2011... have you created any VB programming to teach us how? DAWN on 12/4/2012: I have three questions for you. If these questions have already been addressed, please refer me to where I can find the answers. 1. When I click on "Open Main Calendar Report" and go to print a copy of that month's calendar, multiple pages of the same month are printing. What do I have to do to only have it print one page? 2. How can I program the dbase to allow me to print multiple months at the same time? 3. I would like to open a data entry only of CalendarF each time I click on a particular day of the month in the MonthlyCalendarF so I can add a new appointment. 1. Lessons 9 and 10 cover printing your calendar report. If memory serves, there's VBA code in the button that you click on to open the report that limits the results. It's been a few YEARS since I recorded this seminar, however, so if I'm mistaken please correct me... but I'm certain I gave you the means to just print a single month in one of the videos. 2. This would be best accomplished with a form with two fields on it: Start Date and End Date. Just have the query that the calendar report is based on use those two dates for their parameters. 3. Set up a form with the DATA ENTRY property set to YES. I'm using access 2010. I Placed the StartDate textfield on the same form as the calendar. Everything works fine, except that after I pick a date, I have to close and open the form for the calendar to update. How can I ovoid having to close the form and open it back up to get to my desired month? Shari Martell on 4/3/2013: In am using Access 2010, my form is a full page and doesn't view as a pop up size. I have changes margins already. How do I change? I believe this is covered in the very first lesson: switching from tab view to overlapping windows. It works the same in 2007, 2010, and 2013. Yes, it's possible. You would need a macro or some VBA code to process the report and email it. You could do it with either a button you click yourself once a month or an event that fires, perhaps in the OnLoad event of your startup form. This is much more in-depth than I can explain here, but if enough people want to see it, perhaps I can create an addendum video. Post here if you're interested. Well, what's your complete statement? Did you check to make sure everything is spelled correctly? I too am having trouble with it giving a "This expression typed incorrectly, or it is too complex to be evaluated. For example, a numeric expression may contain too many complicated elements. Try simplifying the expression by assigning parts of the expression to variables." I was curious if you had a work around because I am unable to build the days of the calendar because I'm unable to add the +2, +3, etc. I am using Access 2010. Don Thorpe on 6/30/2013: Richard, I am using Access 2010. Currently I am tracking work groups who are coming to Atlantic City to help with the clean up from Super Storm Sandy. In my DB I capture arrival and departure dates. Is there a way to display on the calendar form and report a contiguous string of dates for a group without entering each date separately? Not the way the database is currently designed. Sorry. A few people have expressed interest in something like this. An easy solution would be to have a form where you enter in the start date and the end date, and Access could automatically put in the multiple appointments for you. That would be a relatively quick fix. Displaying a single continuous appointment across multiple dates would be a MAJOR revision. Alex Hedley on 7/1/2013: There's the Addendum I recorded which might be of some use. Ronald Pero on 8/12/2013: I cannot seem to get the triple state version of the listbox to work in Access 2010. I found an article online that said you needed to change the closed items checkbox data type to integer instead of yes/no. Doing this did seem to prevent me from getting an error but it still doesn't seem to work as a triple state. Does anyone have any suggestions? They're a pain to work with. They're easiest as UNBOUND check boxes to select criteria on a form. If you want to use it with a BOUND field, then YES, you need to make the data type Integer or Long Integer (you can't use a Y/N value). Yes will be -1, No will be 0, NO SELECTION will be NULL. Ronald Pero on 8/14/2013: After further playing around with the triple state of my checkbox is that at least in Access 2010 you cannot put anything in the default value for the checkbox. The video says to set that to False but maybe that worked in 2007, in 2010 at least it makes the checkbox act like its locked and so it won't change state. I'm not sure what you mean. You can set the default value of a check box to YES, NO, or (in the case of a tri-state) NULL. I know for a fact that this works in Access 2007 and 2013. I don't see why it wouldn't work in 2010. Ronald Pero on 8/15/2013: If the time in the CalendarQ query is formatted to show am/pm it seems to not sort times properly. It seems to want to put 1:00pm before 11:00am for example on a given date. This seems to work properly when the query is formatted as simple short time. Is it possible to apply the formatting to the listbox in the monthly calendar form so that am/pm can be shown? If so, how would you do that? Ronald Pero on 8/15/2013: I did not realize you could type null in as a default value. That seems to be what is required for the checkbox to work as a triple state. If you have yes or no in the default field it behaves as if triple state is set to no. If you set default as False it locks the checkbox. It shouldn't happen that way. NULL means "no value." You should be able to specify any of the three as default values. Ronald Pero on 8/17/2013: For some reason when I select multiple rows of objects in order to change the format for example Access deselects all additional rows. It does allow me to select 1 row of items such as labels, listboxes or whatever but it seems to want to deselect all additional rows. I'm not sure why this is happening. I am using Access 2010. This is a minor issue but any help with this would be appreciated. In Access, you can either select individual rows one at a time or you can select a block of CONTIGUOUS rows (next to each other) but you can't select multiple non-contiguous rows with the CTRL key like you can in Excel. Ronald Pero on 8/19/2013: In the video for lesson 9 it seems like you select multiple non-contiguous list boxes which you are able to then modify all at once. How is that done? Can you give me the time index, please? I apologize. I didn't understand your question. When you're in DESIGN VIEW you can click on an item (or group of items) and then hold down the CONTROL key to select additional items (contiguous or not). I thought you were referring to ROWS of data, such as in a continuous form. Sorry... I read through and answer 20 or 30 questions some days and I miss details from time to time. with the new query instead of having to recreate them from scratch. Is this possible? If memory serves, it's the CONTROL SOURCE for the List Box. You could change it to whatever you want. Ronald Pero on 9/4/2013: I am creating my own calendar database now that I have completed the seminar. I created my forms and I tried to remove/delete the custom layout that the form wizard creates as shown in the seminar by going to Design view, and clicking on the Arrange tab. I see a button for Remove Layout but it is grayed out and therefore cannot be selected. Can you tell me what I need to do so that I can remove the layout? The 2007/2010/2013 Layout is AWFUL. I hate it. That's why in my courses I recommend you create your forms and reports from scratch using Form Design or Report Design. It takes more time and effort to remove that dumb layout than it does to just add the fields you want manually in Design View. To remove it... go to Design View. Select ALL of the controls (CTRL-A). Right-click > Layout > Remove Layout. Ronald Pero on 9/4/2013: When designing forms is it possible to apply formatting to text fields so they will be formatted automatically for items such as phone numbers, in other words so that the area code will be displayed in parentheses and a dash will be there between the exchange and the last 4 numbers? It seems that the only options available are for time formats and currency. Sure. You can use the FORMAT or INPUT MASK properties to set this up quite easily in your table so that all of the forms or reports you base on that data inherit it. I cover this in Access Beginner 3. Ronald P on 9/17/2013: The Calendar database I created is for a mobile notary that closes real estate transactions so depending on whether the transaction is a purchase or refinance there can be 1 (borrower) or 2 (buyer and seller) customers. Can you point me in the direction of how I could make my form have 1 or 2 customer subforms depending on the transaction type selected in the master form. In other words can a subform be conditionally turned on or off in a master form? Sure... you could just set up two subforms and set the VISIBLE property to YES or NO accordingly... OR change the source property of the subform to whatever actual FORM you want to use. There are a lot of ways to do it. Sabina Compassi on 9/30/2013: I have exactly the same issue as Andy on 9/18/2009: At approx 10:48 in Access Calendar session 4, where your adding he DateTime< StartDate+1, when i save i rec'v the error "The expression is typed incorrectly, or it is Everything works, if I just have the first part of the clause, without the AND Statement. I don't think I covered this in the Calendar Seminar, but I know I covered adding recurring BILL PAYMENTS in the Payables Seminar. R Isaac on 10/27/2013: I have completed my Access Calendar database and it works! Thank you! I have one problem: I added a combo box to the CalendarT that lists names of volunteers. I added SQL to change first/last names into volname. The names show on my CalendarF, but only their ID numbers show on my ApptListF and therefore also on my MonthlyCalendarF and MonthlyCalendarR. What code and where do I write to get names onto the Calendars? Alex Hedley on 11/3/2013: It sounds like you need to show a different column in the Listbox. Match it to the order of your SQL, Query Fields. Width | 0 | 2"
Joe L on 1/29/2014: Sabina, I had the same problem as well and did not see a reply to this. You have to change the format on the text box for "StartDate" in the Date Picker form to "short date". I think it was defaulted to text or something like that. Carlos Ramirez on 5/22/2014: Hello! I was wondering, I wanna make a access calendar that will show all the tasks that are made or need to be done in the house every week. And can this seminar show me how to update a task x that has been done in the past week to a task x that need to be done in the next week automaticly? The Calendar Seminar has basic scheduling in it, but the point of the seminar is to show you how to FORMAT a printed report and a form to look like a monthly calendar. If you're interested in tracking recurring tasks, I'd recommend my PAYABLES seminar. I show you how to set up recurring payments (monthly, bi-weekly, etc.) which is the same concept, just a different type of data. You most likely have a field name spelled wrong. MICHAEL J on 6/15/2014: I am half way into your Calendar Seminar using 2010, I also downloaded the sample Db for the 2010 Calendar just so i could see how it would all work. I got to the section on graying out the dates but noticed that it was not working as it should in the sample DB. I compared the SQL code from the tutorial and the Db, and there is a slight difference. Just curious to know if an error accured when I downloaded the DB or there is a mistake in the code. Bob C. on 6/20/2014: I am using Access 2010 and all was going fine until Lesson 8. After resizing for the scroll bar and the double click procedure ... my debug is stating that I no longer have my MonthlyCalendarF form and I receive a Run-time error'40036' Method 'Item' of object 'Forms' failed and I always receive a Parameter Box upon opening the Open Calendar Form which is Very Difficult to escape from. Any assistance in this area would be Greatly Appreciated. The Private Sub Command has been gone over and all appears to perfect? "Thank You Very Much" In Advance for any help you can be. Alex Hedley on 6/23/2014: Have you watched the Addendums? Lynda Chase on 9/8/2014: Hi Richard. I have the triple state box working, however, when i click on it, which should 'show open' it comes up blank. ApptListBox.RowSource = "SELECT CalendarID, LocationID, WorkerID, CustomerID, DateTime, Description FROM CalendarT WHERE Closed=TRUE ORDER BY DateTime;"
ApptListBox.RowSource = "SELECT CalendarID, LocationID, WorkerID, CustomerID, DateTime, Description FROM CalendarT WHERE Closed=FALSE ShowClosedItems ORDER BY DateTime;"
ApptListBox.RowSource = "SELECT CalendarID, LocationID, WorkerID, CustomerID, DateTime, Description FROM CalendarT ORDER BY DateTime;"
I can't seem to see where I've gone wrong. Lynda Chase on 9/8/2014: Duh!!! Can't see the woods for the trees - I found my error! Soooo frustrated with myself lol. Sorry for been a time waster. I am using Access 2010 - Is there a way to have the date picker control permanently open on a form. SO when you open the form, the datepicker automatically opens so you can click on the date you want? Is there an easy way to see all the comments I've posted and their responses from you and your team? Not easily, sorry. My Forums lack a few key features that I really need to build into them, and that's one of them. 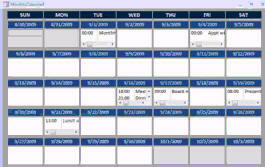 Now that I have built the calendar for appointments, I would like to use it for other types of events such as standby manning, equipment service dates, medicine expirations, etc.. All these items are in different tables so my question is this: Can I just reset the rowsource for the listboxes in code via a loop of some sort or do I have to reinvent the wheel on the calendar form for each different usage? I know I would have to create different queries for each usage but recreating the rowsource is the labor intensive part I am trying to automate. Thanks as always for your help. Are you wanting all of these in the same db? If not just input these events in the CalendarT in separate dbs and they'll show up. Just name the db differently. Another option is a UNION Query but keep it called CalendarQ and the Forms will still work. Wayne Gisler on 11/30/2014: Hi, Richard, long time since I've emailed you. I wanted to see if you could provide me with a concise summary of the benefits of using a customized Access Calendar solution versus an Outlook Calendar. I am not familiar with how to use an Outlook calendars, or how an Outlook calendar could be used to keep up with anything beyond simple appointments and meetings. My goal is to this Access based solution to keep up with vacation requests, as well as who on our team will substitute for an employee who is on vacation in order to complete job duties that must be completed for the individual on vacation. And that's Phase 1. There are a lot of other possibilities. I'd like the feedback requested mainly because I'm not familiar with how Outlook can be used to schedule vacation relief, and I'm anticipating questions from my upper management who will likely oversimplify the use of Outlook. As always, your feedback (and your Seminars) are appreciated. It all depends on your needs, an Access Calendar gives you much greater control over what data you wish to store and how you wish to display it, who can see what etc. You could then link an event to a particular person(s). You could create a Query that splits the data into Quarters. You could use the DatePart() to get which Quarter and then group by that. Stephen McKean on 1/21/2015: hi Richard. I have complete the course. I'm happy with it and it works fine. But did I miss out a section where if one wants to create a new appointment, by clicking on day list box on the "monthly Calendar F form, a new dated record would be created from the "MonthlyCalendarF" form and not use the "CalendarF form to create the new dated entry? I have spent considerable time trying to create this small routine. Is there an addtion to the program that is available? It's been a while since I've done this Seminar but I don't think adding a new record via the Forms is covered. *Replace FORMF with the name of the Form. Or with the DblClick event if the value of the list box is null or "" then create a new record else open the selected appointment. The issue: I have so much info I want on the calendar I had to abbreviate for example. I have a customer like Access Learning Zone on my Form / Database, in order for it to fit on the calendar I would abbreviate it as "A" .... Is there a way to tell my form / database to display or format "A" as Access Learning Zone? You could create an extra Field. Then just show that Field on the Calendar instead. Where 3 is how many characters you want to see. Diane Berdine on 6/23/2015: Have you discussed a work around for access 2010 users who do not have the calendar Control option? I'll need to test this on a machine I've got 2013 on. Should you not always be going from the other Form so that it has the parameter to query from? It'll be expecting a value from the DatePickerF. If that Form is closed then it doesn't have a value, the date, to use in the Source. Shane Johnson on 9/17/2015: What did you do to fix the error of month label Saying November and calendar being October starting minute 7:13? The Listbox has a WHERE clause of Forms!DatePickerF!StartDate. These have probably become out of sync. Jim Ogier on 4/16/2016: I am unable to get the ActiveX Date Picker to display and can not get the greying out of off month days to work. I say the suggestion about running the DoCmd code but I am a novice and don't fully understand how to implement it. Other than that I love the calendar. What version of Access are you using? This control is now deprecated. Jim Ogier on 4/18/2016: Having problems getting the 'Off Month' color to work in Access 2010. How do I get the ActiveX Date Picker to show up on the form or what workaround will solve the issue? Check out the Addendum 2. Which Field is Day bound to? Does it exist in the RecordSource? Jim Ogier on 4/24/2016: The color for greying out non-month date is washed out. If I pick a light blue and insert the code I get a very washed out value (&HD1EAF0). Changing to a darker color (&H3B8194) still shows up as washed out. Any way around this? I am using Access 2010. If you do a solid red does it show up better? You might just need to trial and error until you find a colour that works. Jim O on 4/26/2016: VBRed shows up as Black. are you passing it vbRed as a keyword or "vbRed" in your code? Jim O on 4/28/2016: vbRed works. I am not sure what I used first it may have been VbRed. It is not a serious issue just annoying. I would like to use a color of my own choosing. Chip W on 4/30/2016: I am wondering if there is a lesson to make a 24 hour daily schedule. I am trying to make a scheduler for several interpreters who speak several languages and who will be manning the phones 24 hours a day. Sometimes the interpreters are full time with set schedules and sometimes the interpreters are part time floaters. I was thinking to make the day date field on each calendar date box a clickable event which would open that day's 24 hour calendar. And have a drop down menu to change what language calendar I see on that specific day's 24hour layout. Is there anything like that? The Work Order Seminar has a scheduling system. There is also the Calendar Seminar. "SELECT CalendarID, EmployeeName FROM CalendarQ WHERE DateTime>=#" & Forms!DatePickerF!StartDate & "# AND DateTime ..."
It's been a while since I did this Seminar. Does the sample DB work ok in 2016? Jeremy Heckman on 5/2/2016: I purchased the Calendar Seminar (among many other lessons) and have a question about it. I am attempting to build a weekly "appointment book." If your seminar you say you can just "chop off the weeks you don't need" to make it weekly or bi-weekly. However how do you get it to show the first Sunday before the day you pick instead of the first Sunday before the first of the month. I am using Access 2010. Thanks for the help. You can use the principles from the lesson to go back to the first sunday from the week date you choose to open. Just don't show as many days as the 42. Jon Starnes on 5/5/2016: Just downloaded the sample DB... all the examples work except for the actual calendar. When a date is entered in the date picker, it runs thru a long list of errors messages. After clicking "OK" several times, the calendar will finally open, but there are glitches all across it. Chip W on 5/6/2016: Hi. Yes, I have taken the Calendar Seminar. I have my monthly calendar set up as instructed. I like the monthly view and also have a weekly view. My question, though poorly written, was inquiring about the ability to open one of the days on that calendar view to see it in a 24 hour view by hourly (or half hourly or 15 minute segments). So that if I have 5 one hour appointments on one day, but they might not start directly on the hour, I could see it in a 24 hour calendar view style similar to how outlook sets their daily calendar to show the blocks of time. Or perhaps like the iPhone shows its daily calendar view with the ability to set blocks of times for appointments. You could do the list view with a bigger LISTBOX control. If you actually want an hour by hour you would need to create a form with a control for each time segment then use the similar process for the month view where you query each hour then show against each form. Jeremy Heckman on 5/7/2016: Alex, I understand the not showing as many days as in a monthly Calendar and have no problem with that aspect. However I am am still struggling with only showing the 7 days of the week I pick. It is still showing me the first Sunday of the month (in the case of May 2016) no matter what date I pick in the date picker. I'll need to take a look over it again, it's a loop checking for vbSunday if memory serves, you could add in an extra check to only loop x times. I have figured out how to highlight the current day of the month on the Calendar following Alex. How would I highlight the date that has been selected in the DatePicker Form? I've not tested this but should work, just don't change the month buttons, or you'll need extra checks. Do you have a form called "DatePickerF"? Is there a Field called "StartDate" on it? Is this Form open when you are opening your Form and/or Report? Gioia H on 8/24/2016: No there is no form called "DatePickerF"
You need that form if you are going to reference a field from it. Or change that to the name of the Form that has your control on it. Gioia H on 9/5/2016: Can you please send me a working copy with that form included? I purchased the Access Calendar Seminar but the provided download is not working in Access 2016, I've tried to use it on multiple computers to make sure the issue isn't on my end. Are you opening the Main Menu Form then opening the calendar? You can't open the Calendar Form without using the picker one first. There were changes needed on the Form due to the calendar control being removed. Have you watched the 3 addendums? Where did you download the db from? I'm running Access 2010, and I already followed your instructions in the addendum, which helped a lot thank you. The code just before it (diming S as the Var and changing the backcolor to vbRed) worked just fine. Any thoughts? Richard Bray on 2/1/2017: I am using access 2016. when I Click on activex control There is no Calendar control? Have you closed the DatePicker Form? There are links on the Course Outline page. There is always the Student Databases page too. Masih O on 10/22/2017: I am making a calendar (Calendar seminar lesson 6). I cannot find Calendar control in my ActiveX controls. I did some searching on the net and found out that Access 2010 don't have a calendar control. What do I do now??? If you read the comments you will see a number of options. Did you watch the Addendums? There are loads of comments on this post about the issue, and even an Addendum. Derrick on 3/4/2018: Hello, when I try to print or email the calendar form in print preview in Access 2016 I receive the following error message "A custom macro in this report has failed to run, and is preventing the report from rendering". Any ideas why? Forms aren't for Printing, Reports are.